As if dry skin, oily T-zone, pimples, zits, hyper pigmentation, blackheads, whiteheads were not enough that there is milia too. Let us find out the causes and treatment for milia. Milia is also called milk spots. They are little white or yellowish bumps that happen around the eyes. They can also appear on nose, cheeks, forehead and chest. They can appear at any age but are mostly harmless. Using heavy pore clogging products. Long Term use of steroid creams. Blistering injuries, such as poison ivy. Burn injuries on the skin. Clogged pores are the main reason for milia to occur, so exfoliate at least thrice a week. This will help you to get rid of all the dirt, oil and dead skin from your face and there will be lesser occurrence of milia. Sun damage is also one of the primary reasons. Extreme sun exposure can lead to various skin problems and milia is just one of them. 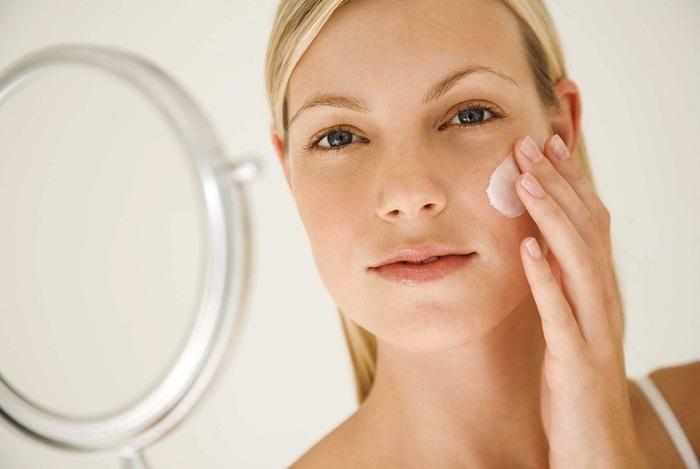 Use a sunscreen with SPF 30 or more daily, even if it is cloudy outside. When you have a dry skin then you tend to use products which are heavily moisturizing and it can sometimes lead to clogging of pores. Try to use water based products on your skin, instead of oil based products. Resist the temptation to scratch them or pop them as they are not pimples. They usually disappear on their own. Scratching causes irritation and damage to your skin and can even leave scars. Use lukewarm water to cleanse your face, as it relaxes the pores. Try to keep your face oil free, so there will be less clogging and follow the CTM routine regularly. Let your skin breathe every once in a while without the use of any makeup. They have fluorides in them, which helps in combating issues associated with milia. Cleanse your face and apply a thin layer of toothpaste on the affected area. Clean the paste with cold water after 5-10 min. The citric acid in lemon helps to open up the pores and dries the excess oil on the face. Just cut a lemon in half and gently rub on your skin(It might sting). Do not go out in the sun without sunscreen, as lemon makes the skin photosensitive. Having a steam every week or so helps to open up clogged pores and also removes the dead skin cells. Make a paste using baking soda and water. Wait for it to dry and wash your face with lukewarm water. Cut a slice of tomato and sprinkle sugar on it. Rub it on your face in circular motions and then wash off with water. Make a paste by adding yogurt with lemon juice, oatmeal and olive oil. Apply it on your face. Leave on for 20 min and wash it off. This will soften and moisturize the skin. If you have milia around the eye area, then this pack is really beneficial as it soft on the skin. Just last to last year I got these Milia…i got really scared…i never had any skin problem and suddenly this thing. there were almost 4-5 milias around my eye. they are very stubborn you cant take them like a regular pimple. As i was relocated to a new city so i thought it may be cause of weather change. but 2-3 months went by but they remained as it is..few gone few came making it equal. out of fear i went to meet Dermatologist. he recommended me what you have mentioned in your article. the problem was i was not cleaning my skin in proper way. and in short i was taking it for granted. as my skin is dry and also due to my job profile i had to travel alot. hence heavy moisturizing cream layered with HIGH SPF resulted in that. i just started following a correct skin care routine recommended by Dermatologist and stopped using and layering heavy products in couple of months it was gone..
its not that now i dont do layering or dont use heavy moisturiser or high SPF. just i am not doing it regularly and also i take care of skin. hence the problem solved. His dear can u plz tell me that correct skin care routine. …. Useful post! I never knew these spots were called milia and I never bothered about them but now I think it’s time to take care about it.